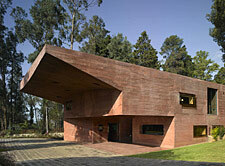 The compound of the Dutch Embassy consists of a seven-hectare wooded site that slopes steeply towards the city. The design task was to accommodate a chancellery, an ambassador’s residence, a deputy ambassador’s house, three staff houses, a small school and a plant room, while retaining and enhancing the quality of the site’s landscape. The strict horizontal volume of the main building cuts into the hill with the sloping terrain naturally dividing the building into two programmatic units: the ambassador’s residence and the chancellery. Its roof is constructed as a shallow pool, an element that combines the Dutch tradition in water management and landscape technology, with the natural craggy countryside of Ethiopia. Living and working under this ‘waterline’ also suggests the Dutch condition where large tracts of the land lie below sea level. While the roof is strictly horizontal, the interior corridor undulates, remaining level with the surrounding terrain. At certain points along its length, the landscape punctures the linear volume allowing the landscape to enter the building. The other elements of the programme are articulated in a similarly ‘camouflaged’ manner; the gatehouse peeks above the entrance wall, wrapped in the colours of the Dutch flag; the extension to the deputy ambassador’s house slides underneath what is one of the rare historic stone houses of Addis; the three staff houses, the school and plant room are built between two walls, the north wall of the compound and a new, parallel wall offset 20m from it. The site’s steeply sloping relief allows all three houses a clear view over the city as the rooftop of one house is level with the garden of the next.